Our blog recently changed names. “The Pipeline” served us well. The Pipeline was our purpose, our trajectory, our theme. While we continue to want God to use us to connect our community to the work he is doing, the blog focus has changed. It’s bigger than just our stories from our trips to Guatemala. And one clear theme is our commitment to being intentional. 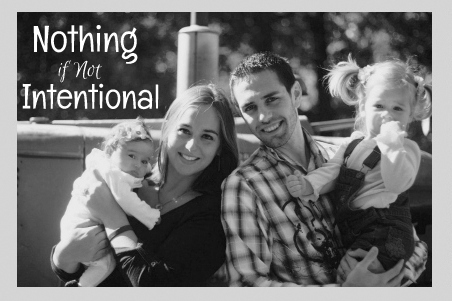 We are intentional in our marriage–weekly date nights, total transparency, and a willingness to never give up. We are intentional in pursuing Daniel and visiting Guatemala. We are intentional with our travel plans. We are intentional in our time with our girls. Our play, rest, books, food–it’s all considered. The past few days I’ve been working on a new Facebook cover image. I’ve read the guidelines and rules. I’ve downloaded fonts. I’ve made sure said fonts are free and available for commercial use. I’ve searched various domain names; I’ve read about self-hosting. I’ve read about sponsored posts and blog growth. I’ve refreshed myself on applicable grammar rules. (Should not be capitalized in the new title? I say yes.) I’ve been digging into Shakespeare, because the phrase “nothing if not” comes from (or was at least popularized by) a line in his play Othello. I was an English major. I like that. Together, Nate and I are a very intentional couple. We are nothing if not intentional.